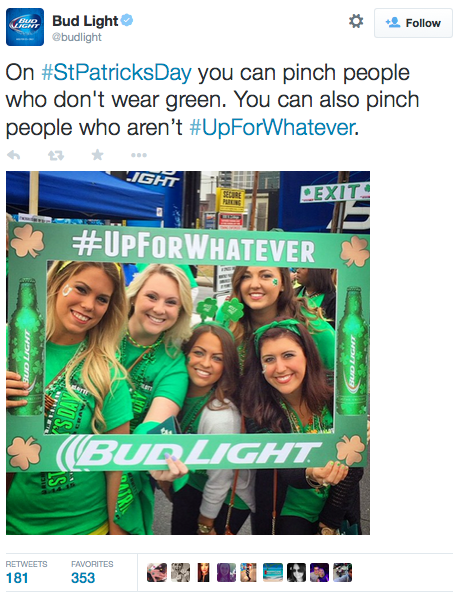 Bud Light bad tweet: Pinch people who aren't up for whatever on St. Patrick's Day. There’s a lot of debate these days about whether young and young-ish people, particularly those using social media, are too sensitive to perceived insults toward women and minorities. Do we take offense too easily and take too much pleasure in shaming others? These are important questions. None of them will be asked about the appalled response to this tweet by Bud Light. It’s perfect. Up for whatever is a phrase that’s clearly derived from down for whatever, which is said about women who are indiscriminate with their sexual affection. In case you didn’t know that, there’s a picture of LADIES PARTYING. And pinching even has the historical distinction of being the stereotypical gross thing that old creeps in an office do to women from the typing pool. This is a bad tweet with a bad message. Here’s another message: Don’t drink Bud Light! Update, 2:20 p.m.: Bud Light has deleted the tweet.